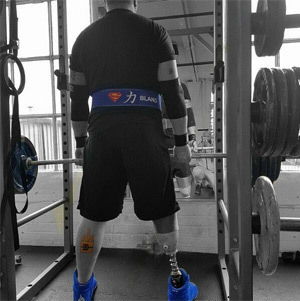 A serviceman who lost his lower leg, following an accident during a Royal Air Force training session, has taken second place in a Disabled Strongman competition. Physfit’s very own Leigh Bland came second in the Smash PT gym competition which was held for disabled servicemen in Milton Keynes earlier this month. The former RAF engineer, from Sileby, who competed with the archery team in London’s Invictus Games in 2014, had his right lower leg amputated following a fall during training in 2009. Since then the Physfit member has been determined to keep up his fight for fitness and has let nothing hold him back. The Disabled Strongman competition, on February 5, was the first one Leigh has entered this year as he works towards his goal to become Britain’s strongest disabled/adaptive man. What is Disabled Strongman all about? The Disabled Strongman competition is organised by Rob Creighton and Mark Smith, who served with the 1st Battalion Grenadier Guards and now runs Smash PT in Milton Keynes. The categories on the day were Deadlift 200kg, Dumbbell Press 40kg, Yoke Press 100kg, Farmers Hold 90kg (each hand) and Tyre Pull over 20 metres. 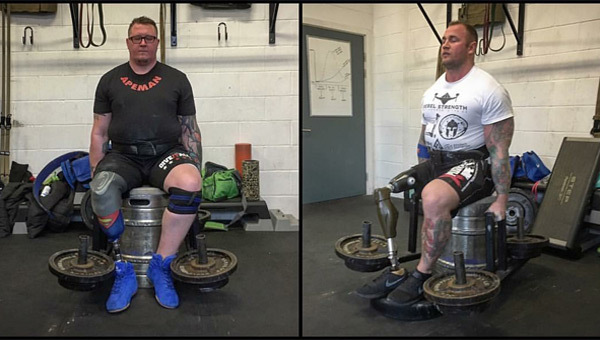 To help make the event perfect for disabled servicemen, the team at Smash PT spent time adapting everything specifically for Disabled Strongman competitions, so that those in the running for the title could meet up and compete in the five events. Leigh said: “I had seen a post on Facebook that Smash PT was holding an introduction to strongman for injured servicemen, so I put my name down which put me in contact with Mark Smith (Britain’s Strongest Disabled Man 2016). The week before the event it was decided that it would become a small competition. I went along not intending to compete, due to an injury I had got from deadlifting that week, however, when I got there, something in my head had changed. I got my kit out of my truck and competed. “Due to inexperience I slipped to fourth place at one point but with one event left I put all I had into it and finished first with an overall result of second place. I was over the moon with that. It was only a small last minute comp but it was good experience and gave me a huge confidence booster for my future events”. At Physfit we take great pleasure in enabling our members to progress well with their levels of fitness, while keeping up the momentum, motivation and enthusiasm needed and taking a step further towards achieving their dreams. We believe that exercise should be more about enjoyment, positive challenge and the chance to feel a sense of accomplishment, which is why we are so proud of the results that our members achieve. As an ex-serviceman, Leigh has not only served his country, but has also shown an excellent example for anyone looking to get fit and healthy. He joined Physfit to improve on his strength and fitness, worked hard with his PT Andy Smith and training partner Jack Cox and is proof that even being disabled shouldn’t have to hold you back. Massive congratulations to Leigh for taking second place in his first competition this year. We look forward to training more with him in the future, while helping with his goal to become the strongest disabled man in Britain. Then, hopefully, the World’s Strongest Disabled Man on September 3 in London. If you’ve been planning to improve your fitness for a while or, like Leigh, have a fitness goal, title or event in sight that you need to be ready for, then today is as good a day as any to get working towards it. Contact Physfit Gyms to book your free induction session and come along and enjoy our positive, friendly environment. Our highly experienced and professional team of personal trainers look forward to helping you every step of the way on your fitness journey ahead.